This timeless mountain retreat is a one-of-a-kind legacy property. Beyond the wrought iron gate, there’s a world of perpetual beauty and serenity. As the gate swings open, it reveals a lush expanse of greenery and mature fruit trees, including mango and several varieties of lychee as far as the eye can see. The anticipation builds as you drive past the caretaker’s house, a large equipment barn, and several guest cottages until the main residence comes into view. It’s then that you know you have arrived! With 128 acres, 75 zoned AG-1 (mostly fruit trees), and 53 zoned P-1 which includes valleys, trails, and endless views. Total homes: 1 large estate with pool, 3 cottages, 1 caretaker’s home, and 1 huge equipment barn. 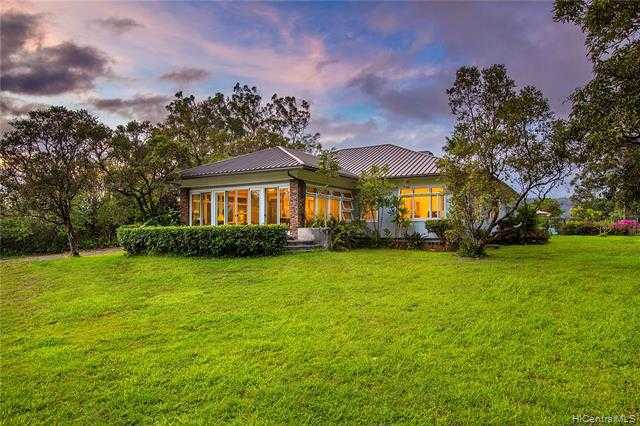 I would like to schedule a showing appointment for this property: MLS# 201901827 – $13,000,000 – 95-1202 Kapanoe Street, Mililani, HI 96789.